You may have noticed the resurgence of WiFi as a feature on recent digital cameras. But it's WiFi with a twist. It isn't the WiFi of a few years ago designed to transfer images from the camera to any other device on a network. It's a private network designed to hook up with just one mobile device for remote control of the camera. Any connection to a wide area network is made by the mobile device, not the camera. 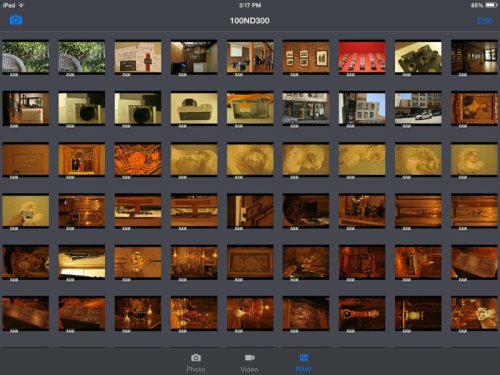 But you can transfer images to the device for uploading elsewhere, and you can also use the device's screen as a viewfinder and make camera adjustments. Nice but what if you have a Canon or Nikon dSLR that does not have built-in WiFi? 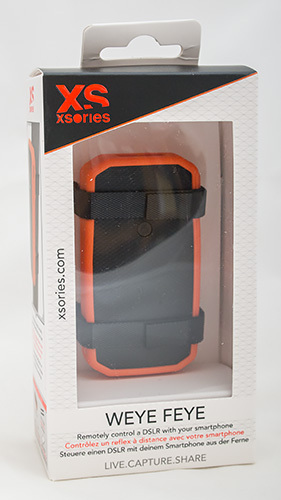 XSories developed the Weye Feye just for you. It's a small hardware box with a USB connection to your camera and an Adroid/iOS app to communicate with the camera through it. We first saw the Weye Feye remote release in action almost a year ago at press event here in San Francisco. A Nikon D5300 was pointed at us as the PR person came around with an iPad that showed us what the camera was seeing. She snapped our photo. And we were sold. We asked what models it worked with and were shown a list that included one of ours. And before you know it, we had an orange Weye Feye to review. 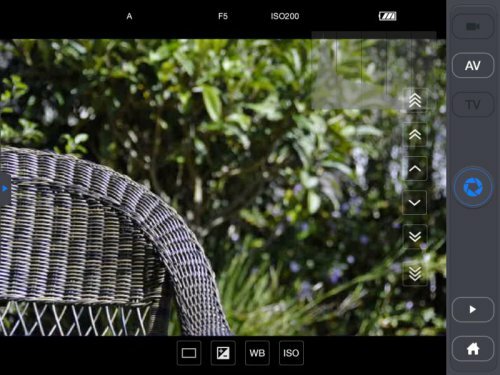 We had only recently reviewed Triggertrap Mobile, an iOS and Android app that can fire your smartphone or tablet camera's shutter and with the right cable control your dSLR. 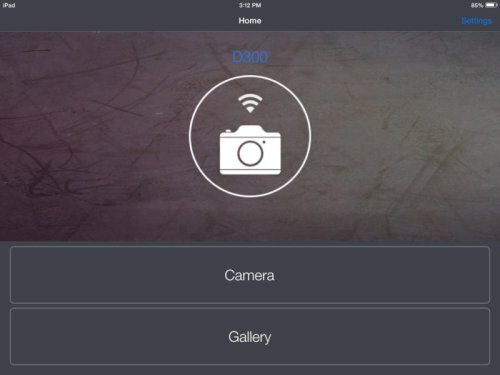 And if you have a second iOS or Android device, you can control that camera remotely, too. We liked Triggertrap a lot. You buy a $20 cable, a $10 camera dongle, the $5 app and if you've already got a tablet and a smartphone, you're set. If you don't have either, you're hosed, though. It's an expensive setup. It has so many modes, you need a manual. And it just keeps evolving, too. So we continue to applaud Triggertrap. Really nicely done. You might think with all that fancy gear, you could see what you're shooting on the remote screen. But because Triggertrap uses the remote port you aren't going to get any images. It's strictly commands in. The Weye Feye, you'll recall, showed us on the remote iPad what the camera was seeing. 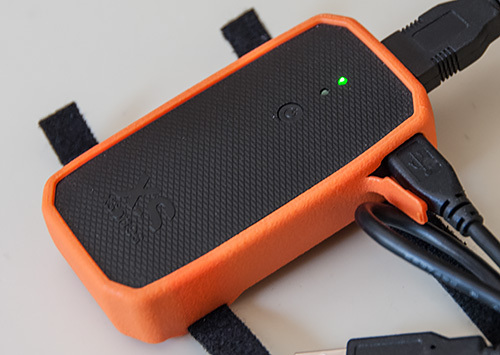 It can do that because it connects to your camera's USB port and -- assuming your camera has Live View -- simply renders the image it receives. The Hardware. A small, protected box with the camera connection at the top and a power port for recharging on the side. You'd only connect one of the cables, either to charge or to communicate. That's a handy two-way connection for other reasons, too. You can also display the images the camera has captured (video, too, if your camera can capture video) as thumbnails and full screen. There's a price for all this, though. Battery power. We'd never gone through our battery quite a quickly as we did using the Weye Feye. But seeing what the lens was looking at on that iPad at the show had sold us. Weye Feye's list of supported cameras is difficult to read. But the gist of it is that only cameras from Canon and Nikon are on it. And not every model, either. Canon models include the 6D, 40D, 450D, 50D, 7D, 5D II, 60D, 650D, 600D and 5D III. Nikon models include the D5100, D600, D7000, D300, D300s, D700, D800 and D90. Presumably derivative models like the D610 are also supported. In the Wild. The two Velcro straps make it easy to attachthe Weye Feye to anything and the USB cable is not very intrusive, making for a compact setup. And, of course, not every control is supported on every camera. The Weye Feye, for example, can't add video control to a Nikon D300, which does not shoot video. Our initial experience several months ago with the Weye Feye was a bust. Not disappointing, but a bust. It simply didn't work with our Nikon D300. It couldn't connect with it, no matter what we did. We tried a lot of things, too, including app updates and a firmware update on the Weye Feye itself. And another Weye Feye. Eventually, we were able to make the connection to the D300 but couldn't control the camera, except to fire the shutter. 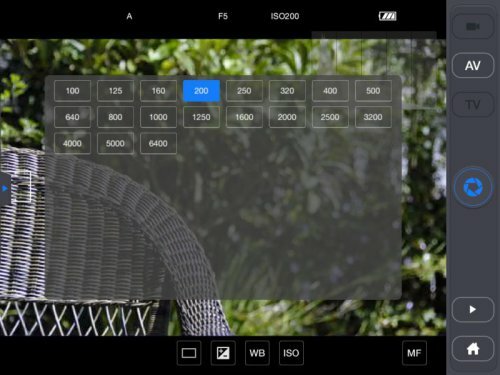 We would tap the White Balance or ISO button on the iPad screen and select a different value but it was never set on the camera. Or reflected on the display. We wrote to Weye Feye support but didn't get a reply. So we contacted the PR firm and Jason Zhang, the main developer/engineer, explained settings are controlled by the Mode set on the camera. Program mode will not allow anything to be set, Manual will allow everything to be set. That wasn't any help with the White Balance and ISO settings, though. So we assumed the D300 just wasn't well supported and put the review on the shelf. While it sat there, we continued to update the iOS app and a few weeks ago took another look at the issue. There was a firmware update for the Weye Feye, so we applied that. And suddenly the D300 came to life through the Weye Feye. One qualification should be made to the latency specification. The published spec would seem to represent the time it takes to transmit the signal from the iOS device to the Weye Feye. But it isn't that simple. The signal has to get from the Weye Feye to the camera. In our case that was via a Hi-Speed USB 2.0 connection and it wasn't quick. And in the real world, the penalty is doubled because you are using the iOS device as a viewfinder. So the data has to come from the camera over USB to the Weye Feye, then via WiFi to the iOS device before you like what you see and tap the Shutter button to send the command back over WiFi to the Weye Feye and over USB to the camera. Then the shot is taken. Missing from the list is a USB cable to connect the Weye Feye to your camera. But there's a good reason. You should only use the cable that was included with your camera. 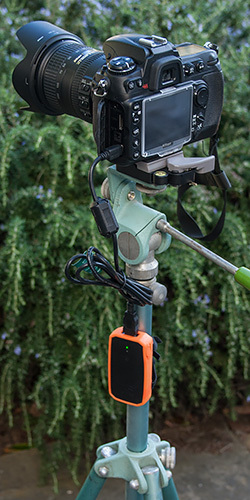 After charging the Weye Feye with the included cable, we connected it to our dSLR with the dSLR's USB cable and strapped it to a tripod. That's all the physical setup required. We set the camera to Aperture Priority and turned it on. 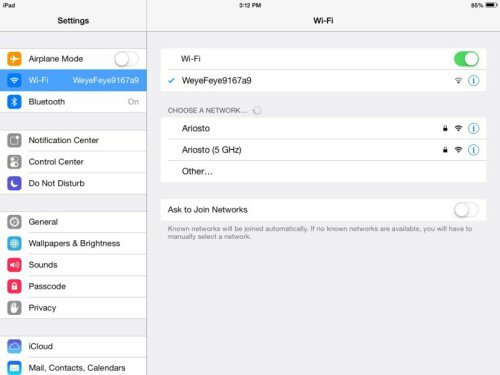 On the iPad, we launched Settings and selected the Weye Feye rather than our router. 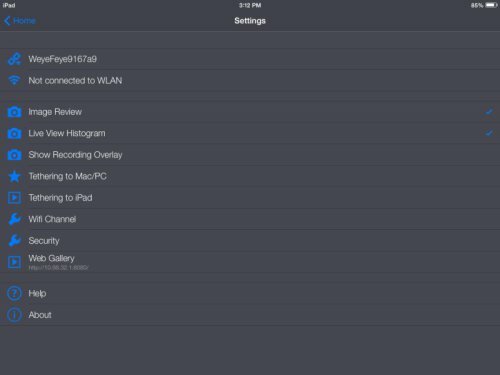 That establishes a Wireless N network between the iPad and the Weye Feye. But there is no pass-through to your router (as there is with a shared USB device), so you won't have Internet access when using the Weye Feye. Private WiFi. We make a WiFi connection to the Weye Feye. Once addressed to the Weye Feye, you can launch the Weye Feye app. The name of the camera appears above two large buttons: Camera and Gallery. Tapping Camera takes you to the live screen showing what the dSLR sees. Connected. Launch the app, it finds the camera. Alternately you can tap the Gallery button to go directly into Playback mode, showing the video, JPEG and Raw images on the camera, as described below. Settings. A list of what the app has set. The list includes the Weye Feye's name and WLAN status (you won't be connected). 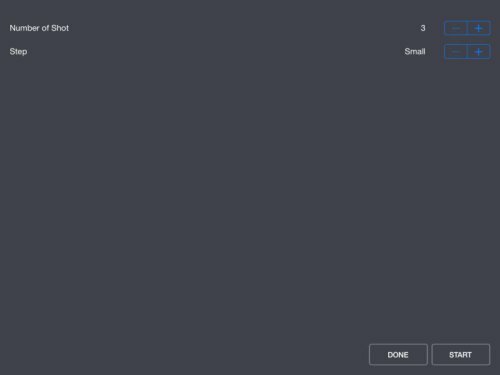 A set of options are listed next with check marks (way on the other side of the screen) to show their status if enabled. Help and About screens are also accessible from the Settings display. 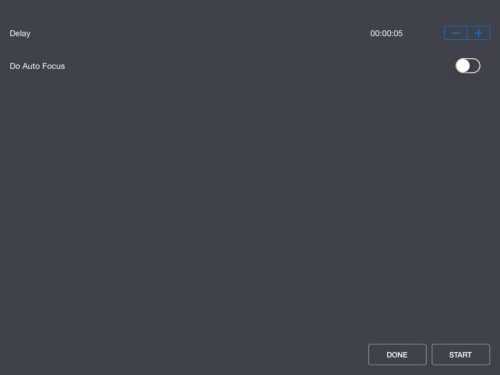 The interface shows a number of buttons scattered around the live view. 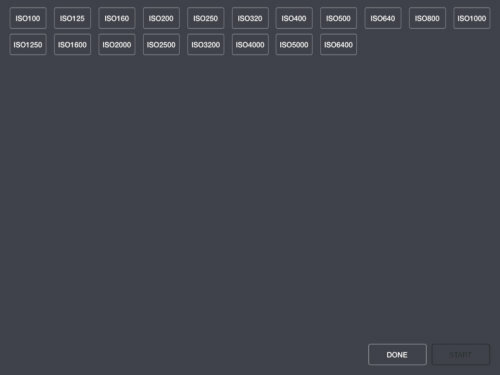 The top row is more or less a status display. Everything else is a camera control. Live View. Note the array of buttons. The status display on the top row includes: the Mode, the Shutter Speed and/or Aperture, the ISO and the camera battery level. Along the right side are control buttons to set the shooting mode, the Shutter button, Playback and Home. And along the bottom are control buttons for the Release mode, Exposure Compensation, White Balance, ISO and Manual Focus. Note also the tab on the left side to pull out the list of shooting options. You have to set the shooting mode on the camera. In addition to the first item in the top display, the buttons displayed on the right will reflect which mode is active. You tap that to make whatever adjustments are available. 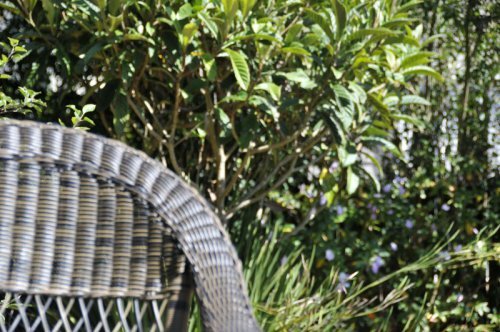 Tap the Aperture button (AV) on the top row to set the aperture if you're in Aperture Priority mode. A list of buttons representing apertures on your lens is displayed. Tap one to set it. If you're in Shutter Priority mode, you can set the shutter speed (TV). If the camera is in Manual mode, bot the AV and TV buttons will be accessible. Apertures. Options depend on the lens and zoom position. Along the bottom of the screen are more camera controls. 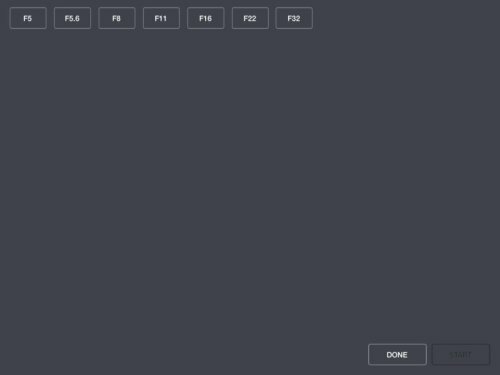 Tapping the rectangular button takes you to your Release mode options. These vary by camera, of course. We had High Continuous, Low Continuous and Single Shot options. Release Mode. Our three options. Tapping the Exposure Compensation button displays buttons for Exposure Compensation. In our case one-third stop increments were displayed from -5.0 to +5.0. Exposure Compensation. Full range in third-stop increments. Tapping the WB button shows you the White Balance options. White Balance. Complete set, including custom. ISO works the same way. Tap the ISO display on the top row and a list of ISO buttons appears. Tap one to set it. Focusing is almost fun on a tablet-sized screen. 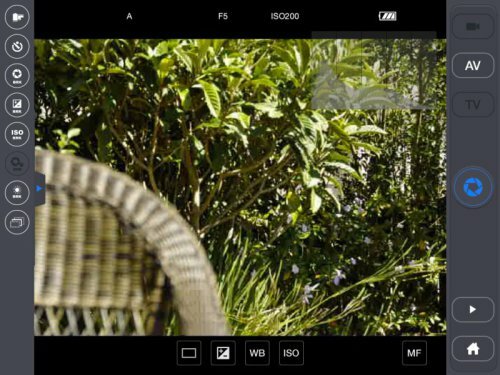 To autofocus, you can tap on the area in the frame you want to target. A white box will indicate the focus area. Tap the MF button to manually focus. You can go to the lens's limit with the double arrow keys or make small adjustments with the single arrow keys. Manual Focus. Limits, large and small adjustments. 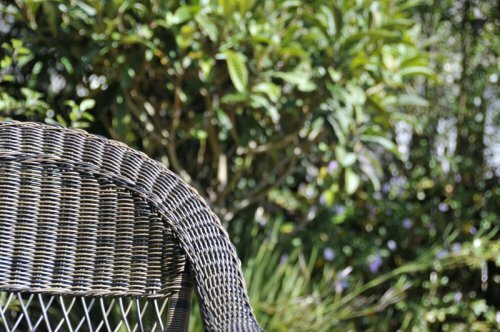 We focused manually on the whicker chair and then on the bush behind it. 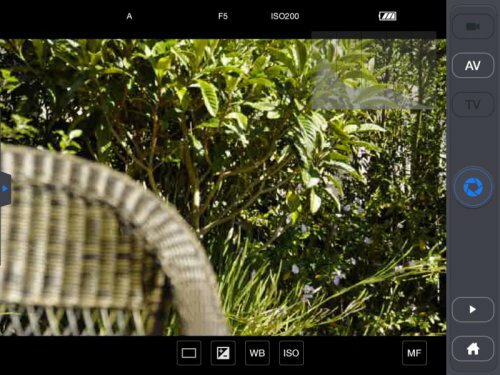 Note that double tapping the iPad screen will enlarge the target for more precise focusing. Double tap again to restore the full frame. Options. Various shooting options are available here. 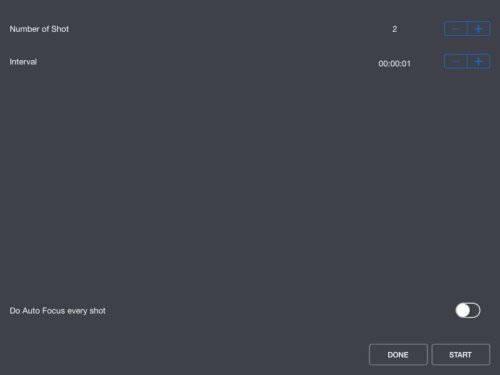 On our screen, the first option enables interval shooting for a number of shots, optionally refocusing between shots. It's followed by a timer, focus sacking, exposure compensation bracketing, ISO bracketing a disabled aperture bracketing , white balance bracketing and intervalometer. Interval Timer. Note the Done and Start buttons. Aperture Bracketing. Select any number of apertures. Exposure Compensation Bracketing. Pick your poisons. ISO Bracketing. Select the ISOs you want to use. White Balance Bracketing. Make a selection. These are not pretty screens but they get the job done. They probably look better on a phone than a tablet. Playback mode was a pleasant surprise, particularly since we were shooting Raw only. You can view Video, JPEG or Raw files. Just tap on any of the options at the bottom of the screen. The Edit command lets you select thumbnails by tapping on them. You can then Save or Delete them. Tapping a thumbnail shows the image full screen. A button on the bottom left lets you delete the image. The Weye Feye is available for $249.99 at B&H and for $309.83 at Amazon. While we admire XSories engineering achievement in developing a WiFi box that enables both remote control and a live remote viewfinder, the practical application can be disappointing. The problem is the lag between what you are seeing on the iOS screen and what the camera will capture by the time it gets the Shutter button command. We rarely got a shot off fast enough to capture a moving subject displayed on the iPad. You really have to anticipate the subject's location well in advance (as they are entering the frame, say) to capture them where you expect (centered). But we did like being able to control our dSLR remotely, setting its various options and using the Weye Feye's various bracketing controls and even remote focusing. So while the Weye Feye isn't for sports, action or event photography, you might find it handy in the studio for portraiture or product photography. It certainly does, with an iPad, give you a luxuriously large monitor. And that earns it a rating of three of four photo corners. Enough, that is, to hold onto it. I commend you for this thorough article on the Weye Feye. I purchased my Weye Feye from Amazon this week and found the small instruction packet lacking in details. I know there is a help section within the application itself but I would have been at a complete loss without your detail "instruction manual." The folks in France or China that are responsible for public relations would be well advised to utilize your services in the production of an instructional video! Again I thank you for saving this 84 year-old Nikon D610 user the frustration of learning by hit or miss.